In true Duggar fashion, Joseph Duggar chose to celebrate his birthday at Marketplace Grill with the family's favorite dessert. You guessed it: the chocolate mess. 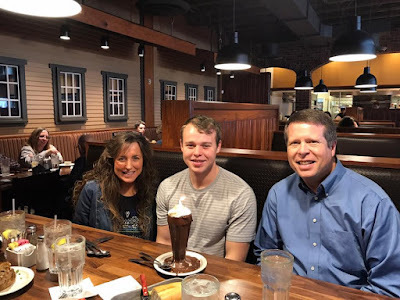 The seventh oldest of Jim Bob and Michelle Duggar's 19 children enjoyed an outing with mom and dad in honor of his 22-year milestone. The Duggars only shared two birthday videos this time. One is from Jill, Derick, and Israel Dillard, and the other is from Jessa and Ben Seewald (embedded below). Before we forget. This has nothing to do with Joseph's birthday, but be sure to head on over to our Bates Family Blog and enter our latest giveaway of Lawson Bates' new CD. As you were growing up we remember you being our sweet, smiley, quiet, little fella. Now you have grown into a strong, quiet and tender young man! Your faithfulness in rising early to spend time alone with God in prayer and in His word is an inspiration. You are such a diligent worker! When you are asked to do a job, you'll get it done without complaint and you often return to see what else there is that you can do to help! We are grateful for your love for others and your leadership qualities as you encourage and disciple other young guys to take their relationship with God seriously. May you continue to walk humbly with Jesus all the days of your life! Why are the birthday messages always about how much work these kids can do, or how many chores? Seriously, that's all we seem to hear about. Is that what's valued in these children? Great point. He's a grown man sitting there with a candle on an ice cream sundae. He looks like a child sitting there. I wish these Duggar adult offspring were treated like adults. What is wrong with a birthday candle for an adult? My husband celebrated his 61st birthday recently and he had candles and I had candles for my birthday. It seems to me the letter is focused on his godly attributes. Yes they talk about the the work they do but they have been taught to work "as unto the Lord" without grumbling.That is something we all can learn. Joseph looks a lot like Jim Bob in this picture. Happy Birthday, Joseph! Again, Jim Bob and Michelle describe their son as they would any of their children- hard-worker, sweet, diligent, encouraging to others. While those are wonderful qualities, those descriptions tend to lose their punch when overused. Surely, he has individual talents and goals that set him apart from the others. I guarantee you I didn't spend my 22nd birthday eating a chocolate mess with my parents, and posting about it online. That's precisely the age you should be out partying with friends! Who took that picture, anyway? There are more people at that table than just 3 (I count 5 glasses of water). Wait, let me guess. Jilly Muffin or Jessa Blessa. What a sweet note! I pray that my daughters will meet godly young men who will love them and the Lord. Joseph is the same age as my oldest daughter. Happy Birthday Joe! Jill looks radiant and Jessa looks so tired. Hope her baby comes on time. Joseph's quiet, humble spirit is a blessing. Happy Birthday, Joseph! Both couples appear very wary of doing these videos. There was nothing "happy" in their tone of voice or mannerisms. Robotic is the word for it. Truly sad. When you live literally across the yard from someone and you have to make a video for them and post it online, it becomes all about you, not them. They're more into rap than jazz. Michelle, your hair looks fantastic!! So soft looking and not stiff. You look really pretty!! Happy Birthday Joseph! That dessert looks yummy!!! Both Jessa and Jill look like they are 30 in these videos. Look like they're 30?!! Really?? Wow, wish I looked that young at 30!☺️ They just like two tired but contented young mamas to me. Jill is the one who has changed the most. I was older than she is when I picked my son up from school one day and was mistaken for a high school student ("What are you doing out of class?"). I was in my late 30's and still getting asked for proof that I was over 21 and could buy wine. Now I have to produce proof that I qualify for senior discounts! Happy Birthday Joseph. I hope you enjoyed your meal and your Chocolate Mess. Growing up I wish I had parents that treat me special on my birthday. It's cool to see Derick looking so much more comfortable in his own skin than when he was first introduced on the show. Derick would look so much better if he cut his hair. He likes it long. This debate is as tiresome as people still calling Spurgeon "Quincy". Are the kids allowed to have different favorite restaurants and desserts, or would that be too rebellious? Derick has to be tired of hearing people say to get his hair cut. I'm a Grandma and my mother tells me I should color my hair. I tell her to hush up. That I'm a grown woman, that I'll do what I want to. Jessa and Ben and Jill and Derick seem to have aged a decade in the last two years. Why is that? Time marches on for each of us.